Encryption is a vital mechanism on the Internet and web. It ensures that a client (user) and server can have a private conversation without being listened-in on — whether it be social media, photo sharing, e-commerce and banking or anything in between. It also ensures communications cannot be altered or tampered with. However, encryption is not a single thing but a collection of protocols and algorithms. Some are relatively old, and some new. And some are relatively weak, and modern computing power can crack them, or will be able to crack them in a few years. So encryption, as an ecosystem of technologies, is always being updated to be stronger and more robust, and — importantly — uncrackable. The first widely-used protocol for secure internet communications was SSL 2 (“Secure Sockets Layer”), released in 1995. SSL 3 was released in 1996; TLS 1.0 (“Transport Layer Security”) in 1999, TLS 1.1 in 2006 and TLS 1.2 in 2008. Microsoft also issued a protocol called PCT in the mid-1990s which was barely used. Some of these are now obsolete, but not all editions of Windows have optimal encryption configurations by default. By default, some editions of Windows enable SSL 2 and SSL 3 which are insecure. Editions up to Windows Vista/2008 only support up to TLS 1.0. Windows 7 and greater support TLS 1.1 and TLS 1.2, but they are not enabled by default for server applications. Windows XP/2003 and earlier have a hard-coded list of cipher suites, whereas later editions allow these suites to be redefined, re-ordered or removed, so the better ciphers may be prioritised. So most versions of Windows need intervention to enable the superior versions and therefore provide the best encryption experience for clients. The most common uses for encryption in a Windows server context are https/web (Internet Information Services), Remote Desktop/Terminal Services, email (SMTP, Outlook Anywhere) and VPN. Likewise in a Windows workstation context, as a client to those services. Ensuring that your servers are offering only the best encryption is the best way to protect your clients, but there is also an argument to deploy the following changes to workstations so they, too, only negotiate with other servers with the best possible encryption. Ensure Windows is fully patched. Windows Server 2008 with Service Pack 2 — Support for TLS 1.1, 1.2 was added in 2017. Windows Vista/7/8 — MD5 deprecated by KB2862973. Windows 10 — Old ciphers removed in Fall Creator's Update. If using Windows 8.0, upgrade to Windows 8.1. Obtain a certificate from a trusted certificate authority. Windows can issue its own certificates, but because only a small number of certificate-issuing authorities are trusted by web browsers and other clients, the client applications will notify the user that the certificate was issued by a system it doesn't trust. Although this doesn't, as such, affect the encryption, it generally produces enough confusion in users that it places a support burden on IT helpdesks, who have to field queries about certificate errors, and/or desensitizes users to them. Additionally, Windows Server 2008 and earlier or Windows 7 and later without KB2949927 will issue certificates using SHA-1 hashing, which is being deprecated arround 2017 such that many client systems will refuse to communicate with a server that uses it. As of 2014 there were still some certificate authorities that issue certificates with these hashes. Before renewing or obtaining a certificate check that it will use SHA-2 hashes. See also http://blogs.technet.com/b/pki/archive/2010/09/30/sha2-and-windows.aspx. See also Using A Trusted Certificate on Windows Remote Desktop / Terminal Services. If the server is hosting a website, go to https://www.ssllabs.com/ssltest/index.html and enter the URL. This doesn't mean, however, that the server will communicate with clients using weak encryption. Well-behaved clients and servers negotiate a connection using the best possible encryption they both support. But the existence of weak encryption on the server allows for attacks against the communication which could trick the client and server into using weaker encryption (a “downgrade attack”, such as the so-called FREAK attack) or attacks against the certificate (DROWN). For Windows Server 2008 SP2 (with KB4019276), or Windows 7/2012 and above, ideally you should have an ‘A’ or ‘A-’ rating. For earlier editions, the maximum possible may be ‘C’ due to lack of TLS 1.1+ support in those operating systems. Furthermore, it is preferable to obtain the best possible rating but also to reduce the number of warnings. So a ‘B’ rating with few warnings is preferable to a ‘B’ rating with many warnings. 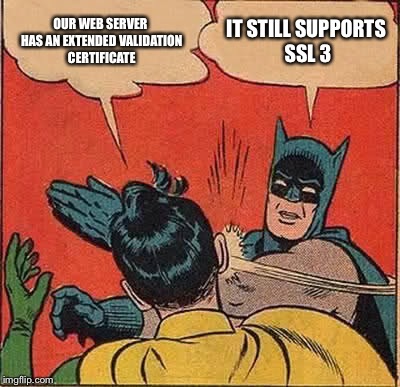 SSL 2 and SSL 3 are old, obsolete and contain many weaknesses. In 2014, SSL 3 was found to be much weaker than previously thought; this is the so-called POODLE vulnerability. Disabling these protocols should only affect obsolete (and therefore unsafe anyway) web browsers, such as Internet Explorer 6 on Windows XP/2003. There really is no reason for any web service to support these browsers and no reason to provide older, unsafe encryption protocols for their benefit. Why not just enable TLS 1.2 and disable everything else? TLS 1.0 is still a necessary configuration option on servers, because some down-level clients support only up to TLS 1.0. As these clients become obsolete, there may be a case to remove TLS 1.0 more widely. TLS 1.0 is obsolete, but older clients communicating with this protocol is not a problem in practice (for the moment). In any case, clients and servers which support TLS 1.2 will communicate with that protocol by default, so the presence of TLS 1.0 is moot in that circumstance. Windows negotiates a cipher suite to use with clients, and has a default list of suites to offer in order of preference. However the default list contains weak suites and does not prioritise the best suites. where cipher1,cipher2,cipher3 is comprised of the list below, with a comma between ciphers and no line breaks. This configuration also enables Forward Secrecy. NB. The preferred way to manipulate the cipher list is using the Group Policy editor, by opening gpedit.msc and browsing to Computer Configuration → Administrative Templates → Network → SSL Configuration Settings, then switching the setting for SSL Cipher Suite Order to Enabled, and entering the cipher list. However the gpedit user interface only allows a cipher list up to 1,023 characters long. (To support Windows XP/2003 servers and clients, add TLS_RSA_WITH_3DES_EDE_CBC_SHA. This is about the only relatively secure cipher available for those operating systems. As of mid-2015, Internet Explorer 8 on Windows XP/2003 is deprecated and unsafe. So this cipher suite should only be added if support for those clients or servers is unavoidable. Client systems should be migrated to use Mozilla Firefox or Chrome in any case if deprecating the operating system is not possible. After making any of the above changes, reboot to take effect. If hosting a website, re-test the URL. If you are using a non-Microsoft service on a Windows server, hardening Schannel may not affect it. For example, Apache on Windows uses OpenSSL for cryptography. Non-Microsoft web browsers have their own encryption stacks. Many applications which are cross-platform tend to use OpenSSL et al to reduce the burden on supporting different stacks across different operating systems.